Hey there everyone, I've decided it time for a little update post! 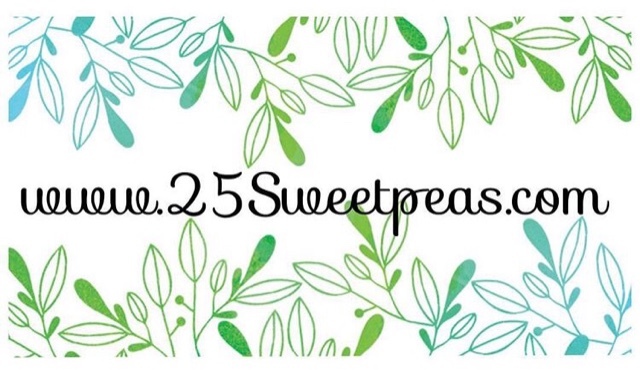 So I don't know if any one has noticed, but I am now officially www.25Sweetpeas.com! I had been thinking about buying my name for a long time and it finally felt right! It was actually done last week but I had a few issues getting it up! Thankfully yesterday I got it all worked out and now I can type in www.25sweetpeas.com and get here!! Which is super exciting! It all seems so much more official for some reason! With all of this being new the next few manis will still have the old .blogspot.com water mark but by the end of this week it will be all .com!! I was excited to edit today and have to type .com it was so much simpler and looks more official! :) Thank you all so so much for every view and comment on here! Thanks to you all I am getting to some real amazing thing and I couldn't be more thankful! I hit 15K views on here this weekend which is amazing considering I haven't been on here for even a year! So thank you thank you!! As an update in other sorts.... I am working more on tutorials these days and trying to add in some other videos for you all on my YouTube which you can check out here.... 25 Sweetpeas I made a swatch video for the OPI line I reviewed and was surprised, it's now my most watched video, with 100 some views! That is crazy! I know 100 isn't many to some but to me that seems like a lot!! That all being said since you all seemed to like that one I may try and do some more like that. :) It was one I really wasn't sure about but I think now I've gotten over the initial part of it I could definitely do more! Also if you all ever have any video request, let me know! I will see what I can do! Now one more thing before I let you all go! In about a week or 2 I will be announcing something pretty big! So be sure and watch for updates on that!! Ahh, I'm so so excited about the blog this month! This holiday blogging season is going to be wonderful! Thanks again everyone for everything! I really appreciate it all! !